All You See Is a Big Gray Box? This program uses Swing and requires Java Runtime Environment (JRE) 1.4 or above. The current version is Java SE Version 7 Update 55 as of May 2014 and these applets are 100% compatible. If you see a red "X", you should update your JRE. You can download the latest from www.oracle.com/technetwork/java/javase/downloads/index.html and scroll to the "Standard Edition" section. Download and install the JRE, or if you write Java code then get the Java developer's kit (JDK) instead. Do NOT install "Ask Toolbar" nor the "Ask" search provider and definitely NOT allow "Ask" to set your home page. If my applet still doesn't work, open your Java Console window in your web browser. Copy and paste its contents into a message and e-mail it to me for trouble-shooting. The first few lines are especially useful since it identifies your version of Java. 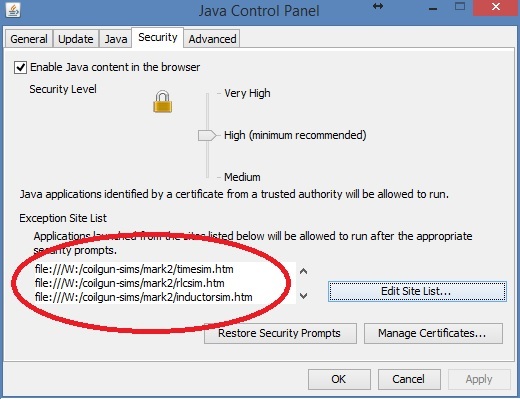 TimeSim1.java uses a JTable embedded in a JScrollPane to run the user interface. Nearest.java converts double-precision numbers into engineering notation. Capacitor.java represents a single capacitor. It has a factory method to deliver an array of industry-standard values. Inductor.java implements the three different inductance formulas. For usage examples, you can see how to call the components from my unit test files (based on JUnit).